Thank You to our Spring Badger Volunteers! Working with Volunteer Land Stewards has always been an important part of Aldo Leopold Nature Center’s programming, enabling us to share land stewardship practices with our community and complete important land restoration work. The Badger Volunteers program through University of Wisconsin Madison’s Morgridge Institute is a perfect fit for ALNC. Every semester, ALNC has a chance to meet a new crew of enthusiastic UW students and introduce them to our programs, habitats and nature trails. 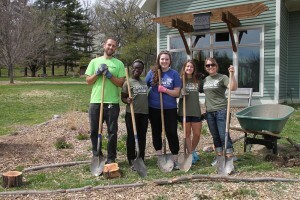 Badger Volunteers is a semester-long program pairing student teams of 1-4 students with community organizations to volunteer each week, building connections between partner organizations and students over the course of the semester. 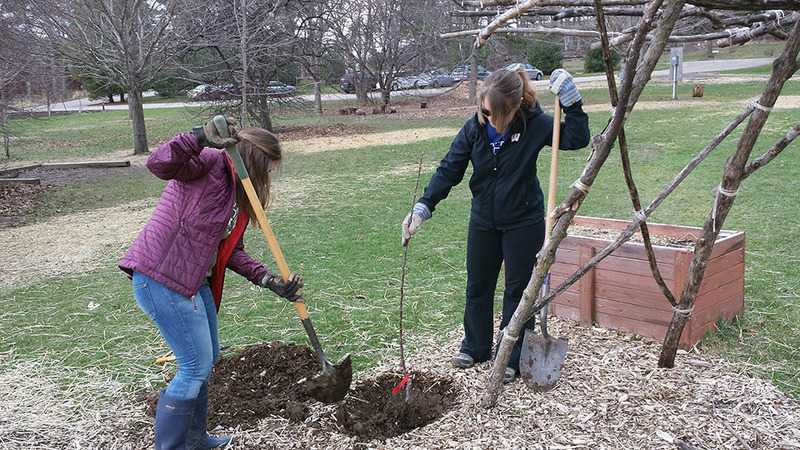 The nature center has worked with Badger Volunteer teams for several semesters now on projects varying from tree trimming and planting, trail restoration, and tending our phenology garden. This semester, a great group of students – Gbemi, Madi, Taylor and Becky – joined our Facility & Grounds Manager, Josh to lend helping hands on all these projects and more. With majors ranging from Microbiology to Communication Sciences, the students were interested in educational and land restoration aspects of ALNC’s work. Taylor said a highlight of the semester for the BV team was the annual controlled burn in the prairie, which took place one of the March Fridays they were onsite. Observating and helping out our trained burn captains was a great hands-on way to experience land restoration up close, and seeing the results – the prairie greening up in the weeks following the burn – was an added bonus! The BV team also worked hard during their visits on removing invasive species and planting trees. Becky told us, “”volunteering here is a great, relaxing way to be off campus for a little while, hear a ton of birds, and enjoy nature.” We’re so glad to be a part of the Badger Volunteers partnership, and so thankful to the BVs and all of our volunteers, interns and supporters! Learn more about volunteer opportunities on the website here.